Anthony Robles was a huge success. He did a fabulous job with the high school presentation as well as our main event. He is a remarkable young man and we thoroughly enjoyed him. Anthony Robles was BEYOND AMAZING! The crowd LOVED him! The staff thought he was absolutely stellar! Anthony Robles was amazing! From the dinner on Wednesday through today at St. Christopher's Anthony Robles was humble, sincere, and spent extra time with several folks at all events. His message was powerful and from the heart. He impacted many lives with his faith, focus and challenge to people to live their dreams and trust that God has a plan for them. First, Anthony Robles showed up at the arena as planned with an ambitious smile, which was a great first impression. However, it was the impression Anthony left over the next 6 hours that will last for a very long time with our staff, graduates, and their families/friends that were in attendance. Anthony was gracious and very kind to all those he interacted with, and this is a testament to his humility and genuine care for others. Anthony was by far the easiest, most approachable and accommodating speaker we have ever used. His speech was not only appropriate for the occasion, but it inspired and motivated many who needed a message like his at this time in their lives. Anthony was purely the best speaker we have used. I not only highly recommend his services, but will be working with the more than 20 campuses in my region to look at Anthony as a speaker in the future. Anthony Robles’ presentation could not be any better! He is a wonderful young man with a remarkable story. He was very well received by both students and adults. He is genuine and sincere, and his powerful message of believing in oneself resonated with all in attendance. We all look forward to his continued success. 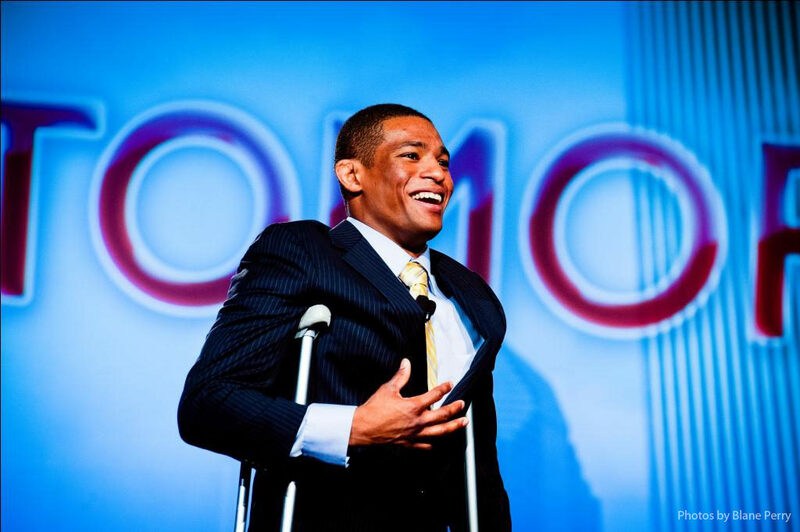 Please extend our sincere appreciation to Anthony Robles for providing the perfect kick off to our Conference. His inspiring presentation was the start of an amazing event for us. There were a lot of high five's throughout the conference where people were saying, "hey, we're unstoppable!" He is an incredible person as well as an amazing athlete. Wow! Anthony Robles was terrific. Everyone thoroughly enjoyed his presentation and hearing his inspiring story. He really set the tone for our event, and going forward we will leverage his mantra—unstoppable. While Anthony was certainly a great wrestler, he is an even better person. Who wouldn't love Anthony Robles? He created fans and he created fans for our League. When I read his story, I knew he was a wrestler and I knew we were an organization of women. Yet, his story to me was about how we all wrestle with life. He sent that message loud and clear. There were several student athletes in attendance, and I loved the part when he spoke directly to them. That was so meaningful.